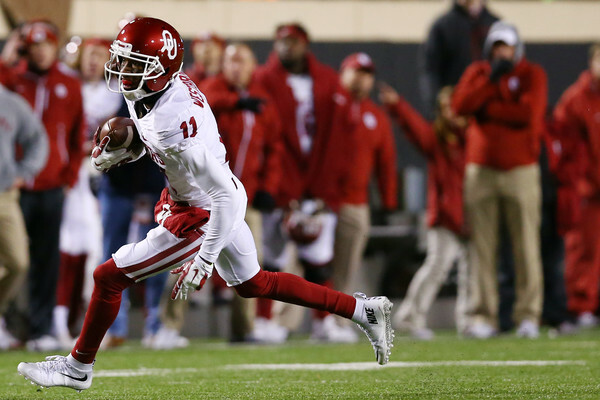 University of Oklahoma wide receiver Dede Westbrook has been named the Big 12 Offensive Player of the Week after his record-breaking performance in OU's 45-40 win over Texas on Saturday in Dallas, the conference announced Monday. Playing in his final Red River Showdown game, Westbrook caught a career-high 10 passes (the most ever by an OU player in the series) for a school-record 232 yards and a career-high three touchdowns as the Sooners finished with 672 yards of total offense, five shy of the program record against the Longhorns. Westbrook's scores came from 71, 42 and 47 yards out, and all 10 of his catches were made by the 5:39 mark of the third quarter. The senior from Cameron, Texas, teamed with Samaje Perine to give OU its first ever 200-yard receiving and 200-yard rushing duo in the same game. Perine ran for 214 yards and two touchdowns on 35 carries. The Sooners also became just the fifth team in FBS history to finish with a 300-yard passer (Baker Mayfield; 390), a 200-yard rusher and a 200-yard receiver. The victory was OU's fifth in its last seven games against Texas and improved head coach Bob Stoops' record against the Longhorns to 11-7. Stoops holds the school record for wins in the series. Over the last two games, Westbrook has registered 17 catches for 390 yards (22.9 average) and five TDs (all of at least 40 yards). The 390 yards represent a two-game OU record. In Big 12 play, Westbrook leads the league in receptions (8.5 per game), receiving yards (195.0 per game), all-purpose yards (197.0 per game) and scoring (15.0 points per game). Oklahoma (3-2 overall, 2-0 Big 12) hosts Kansas State (3-2, 1-1) on Saturday at 11 a.m. CT at Gaylord Family — Oklahoma Memorial Stadium. Tickets are available for purchase online or by calling the OU Athletics Ticket Office at 800-456-4668.